At Quality Gear we are proud to offer a wide variety of ready-to-install steering pumps and parts to fit today’s most prevalent steering applications for your Car or Light Truck. As well, all of our ready-to-install Quality Gear steering pumps come complete with canister for your convenience and to save you time. Quality Gear steering pumps are Dyno-Tested to ensure optimal flows and pressures at both high and low operating temperatures. Our steering pumps are also tested for symptoms such as over steering, output torque and lost motion using a Dyna-Steer Analyzer which simulates real world road conditions. Original Equipment Manufactures must comply with certain specifications and requirements when manufacturing steering pumps. 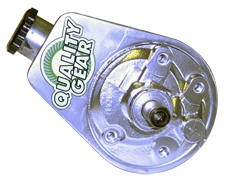 Here at Quality Gear, steering pumps are engineered and manufactured to meet or exceed these OEM standards. Also, all Quality Gear steering pumps must pass ISO 9001 standards which have been set out and maintained by the International Organization of Standardization. These standards ensure a quality, tested product each and every time. What does all of this mean for you? It means that Quality Gear steering pumps offer you proven quality standards, safety, convenience and a great value. Contact your local Quality Gear distributor today for more information.